Much unlike the creamy curry dishes you would find in takeaway containers. 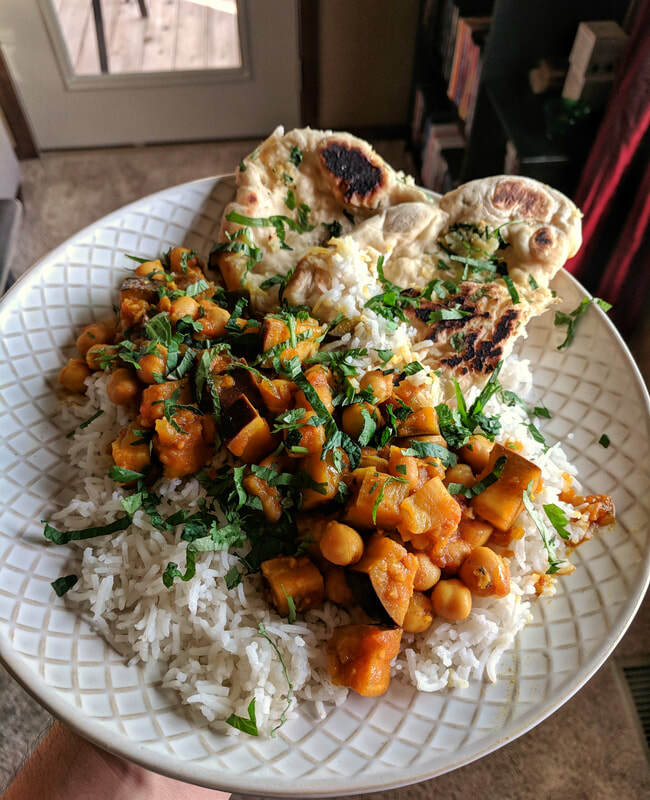 If you're looking to cut out meat in your traditional Indian rotation and need to also save some money at the grocery store, you can create this hearty meal for dirt cheap, and in just under an hour cook time. Am I advocating for a fully vegan life? Not necessarily, but there are distinct benefits to it. Give it a shot. Your wallet will thank you. Don't be perturbed by the unpeeled eggplant - it softens as you cook. The scent coming from your kitchen will well be worth your cutting board woes. Mince shallot, ginger, and garlic. Drain and peel chickpeas (rinse them too if they're canned). Cube eggplant into 1/2-3/4 inch cubes - roughly the size of aforementioned chickpeas as this will help them cook at similar rates. Using a food mill or box grater, process your fresh tomatoes into a pulpy mixture - normally I would advise against keeping the seeds, but the extra liquid helps. If you can, though, minimize the amount of tomato skin that you get into this mixture. If you're making naan, start blooming your yeast in 105 deg F water. [Important note: it's generally better to err on the side of caution and use too cold of water rather than too hot as the heat will kill the yeast] Toss in a pinch of sugar to give the yeast a little snack. Whisk to combine. Rinse basmati rice of extra starch. Tear (or julienne) cilantro and mint leaves and toss together into a green-colored and indistinguishable mess of herby-goodness. Preheat a Dutch Oven over medium-ish heat. Also preheat a cast iron skillet over medium-high heat (this is for the naan). Get ready for the easiest naan recipe of your life - 3 parts water to 8 parts by volume flour and 3 tsp of baking powder and 1 tsp kosher salt. Combine your bloomed water-yeast-sugar mixture with the dry ingredients and knead for a few minutes. At the end of the day, you don't have to be too judicious about this since you're making glorified flatbreads, but a little bit of gluten development is always good. Allow this to rise for at least 25 minutes (can be up to a couple of hours). Start toasting your whole spices (or ground if you're into that) in the dry Dutch Oven until fragrant - try not to burn these, so keep them moving until some of their oils have seeped out. Bring them to a mortar and pestle and grind up. Add some olive oil back to the pot and begin sweating down your shallots, ginger and garlic - I'll say it again here, don't saute them, just get them soft. It's not fajita night - that can be next week. Once the aromatics are nice and soft, feel free to throw the spices back in (you don't want to risk burning them in the oil) and start adding the remaining veg (tomato, chickpea, and eggplant). Bring to a simmer and cook for 45-ish minutes - adding a splash of vegetable stock if things get TOO dry. You're basically looking for the eggplant to be al dente, even though that term shouldn't apply to Indian cuisine. All I'm saying - you don't want it mushy, unless baby food texture is your angle. Your end goal is not to be soupy but there should still be a nice sauce from the reduced tomato and any other liquids given off by the veg. While that's cooking away, you can go ahead and cook your rice as you see fit and take your attention towards naan-ness. I've experimented with omitting any oil in the cast iron to make naan - and I've found some solid results as long as you keep a watchful eye on it. Naan can go from zero to burned in a matter of seconds. Take your mass of naan dough and pinch off lemon-sized balls and begin stretching it out much like how you would stretch out a pizza dough. You could roll it out if you like, but I like the imperfections - makes it a lot more homely. If it tears, it tears. You'll still eat it, I mean who are we kidding? By now, your cast iron should be pretty hot. Carefully spread the dough out on the skillet and don't touch it until it's released on its own. Poke at it every now and then to see if it's done that and then flip it over. You should see some nice pockets of char/golden brownness. Cook this other side for a minute or two or until you feel like the batter isn't raw anymore. Continue until there's no more batter. Then, it's time to feast. Serve the curry over rice and naan. Liberally (read: sloppily) toss all the herbs on top.